Local conservatory company, J.H. Leeke and Son, has been awarded membership of a nationally recognised initiative to bring peace of mind to homeowners when selecting and purchasing a new conservatory. 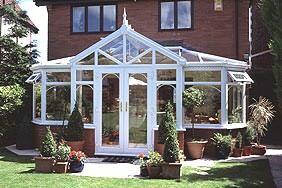 Leeke’s has passed stringent vetting criteria to become a member of the Ultraframe Registered Conservatory Installer Scheme. The Scheme, administered by the market leader in the design and manufacture of conservatories, Ultraframe, gives prospective purchasers confidence that they have selected an installer who will provide the highest standards of design, workmanship and customer service. To be accepted for the scheme, companies have to pass an installation test to demonstrate their ability to carry out installations to the highest standards, and undergo a number of vetting and selection procedures, including approval of customer references. Leeke’s has committed to an Ultraframe annual training programme and regular monitoring of its performance as part of their membership. Ultraframe’s Managing Director, Vanda Murray OBE, said: “The Ultraframe Registered Conservatory Installer Scheme supports homeowners by promoting the highest standards of workmanship and service. We are committed to raising standards across the industry and doing everything we can to give consumers complete confidence in both our products and in the companies who install them. A scheme like this allows the customer to make a more informed choice of installer and to have confidence in the performance of the product they are buying." Ultraframe has recently launched a fully interactive and inspirational website, www.ultraframe-conservatories.co.uk. As well as showing you the latest in conservatory products, the website lets you create your own 3D design on screen to see which of the different conservatory styles available best suits your home. With branches in Llantrisant, Cross Hands and Melksham, Leeke’s is the leading conservatory installer in South Wales and the South West, providing award winning bespoke conservatories in a range of styles and to suit all budgets. For more information, or a copy of Leeke’s recent brochure, call freephone 0800 0157749 or log onto www.leekes.co.uk.